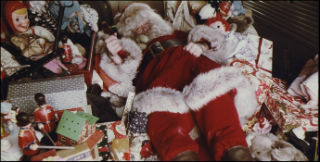 One Christmas Eve, Harry (Brandon Maggart) suffers the emotional trauma of seeing his mom getting it on with his father in a Santa Claus costume. Many years later he works at a toy factory called, ‘Jolly Dreams.’ Harry is obsessed with becoming Santa, he’s made a suit, and he keeps a list of naughty and nice kids. His co-workers make him miserable and his brother’s family don’t care for him. Finally, Harry snaps. He steals toys from work, dons his suit, and sets out to deliver good cheer and punish the naughty. Harry’s brother Phil (Jeffrey DeMunn) realizes too late that something is deeply wrong with him. If you go into Christmas Evil expecting the kind of garish horror of the Silent Night Deadly Night films, you’ll probably be disappointed. Christmas Evil is very low key. The story is designed to slowly pull apart the soul of its main character, leaving only a shell that acts out lost holiday fantasies in bizarre and murderous fashions. I think Christmas Evil is on par with Cronenberg’s The Brood (1979) in depicting the depressing gray hellscape of winter. Fat, drunk and stupid is no way to go through Christmas. It's not all gloom and insanity. There’s a thread of understated gleefulness in the film. It enjoys taking traditional icons of Christmas, Santa Claus, toys, and children and casting them in a light that makes them familiar and sinister at the same time. It’s difficult to watch Harry be abused by everyone around him in the most passive-aggressive ways possible. The film cruelly doesn't allow the viewer to derive much satisfaction in watching him strike back at those who have wronged him. It’s stranger to watch him live out his Santa Claus fantasies by breaking into homes to deliver toys. Acting out the Santa Claus myth in the grimy real world reveals just what an unsettling experience it would be. 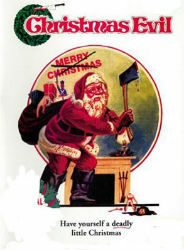 Christmas Evil bucks the trend of most slashers by having a character who has experienced some psycho-sexual trauma when he was young, but doesn’t act out his violence primarily on women. Brandon Maggart does reasonably well in crafting the character of Harry Stadling. He’s a pathetic loser. The only thing he manages to accomplish, once he does crack, is to become an murderous pathetic loser. Harry’s brother Phil is the one other character who seems to aware of Harry and his growing psychological issues. The rest of the cast are asked to do little more than thoughtlessly trample on Harry’s happiness. The film is shot with a dreamlike haze that serves to heighten the contrast between the suburban squalor and the wispy fantasy world of Harry. Vinegar Syndrome’s recent Blu-ray release has done a superlative job of revitalizing the look of a movie that has existed primarily as dim VHS transfers packed in those one hundred movies for $20 sets. Christmas Evil is by turns grim and silly. It also features an end that is astounding to say the least. It’s John Waters’ favorite Christmas film and with good reason.